(CNN) -- The phrase "like father, like son" is ringing true for Texas Rep. Ron Paul. Rand Paul says his career as a political outsider should be a plus for voters. His son, Rand Paul, announced this week he's set his sights on the Kentucky Senate seat being vacated by retiring Republican Sen. Jim Bunning. "I'm very worried about our country; I'm worried about the debt. I'm worried about what the debt will lead to," Paul said in an interview on CNN's "American Morning" when asked why he's jumping into the political arena. "Both sides of the aisle -- Republican and Democrat -- have been unwilling and afraid to address the deficit, and someone's got to." The Kentucky Senate race is particularly high-profile since a seat held by a Republican will now be up for grabs. While Grayson is considered the frontrunner in the Republican primary, "Paul will make things interesting for sure," said Al Cross, a veteran political writer in Kentucky and director of the Institute for Rural Journalism and Community Issues at the University of Kentucky. "Trey Grayson is a very capable person, has a great deal of potential, but he has never really run a high-profile, hardball race, and I think that Paul is going to have the resources and the determination to hold his feet to the fire when it comes to issues," Cross said. Some Republicans aren't quite sure about Grayson, Cross noted, because he started his political life as a Democrat. "[Paul] will have an impact in this primary. He will have money to spend. He will have a message to deliver, some people will find him a more authentic Republican conservative candidate than Grayson," Cross said. Paul, however, has no traditional political base in Kentucky, and Grayson is more of a mainstream conservative like the state's other senator, Senate Minority Leader Mitch McConnell. Paul, like his father, is a strict constitutionalist who believes in traditional Republican principles like small government and a free-market approach to the economy. And another thing he has in common with his father: He's also a doctor. Paul has worked as an eye surgeon in Bowling Green, Kentucky, for the past 18 years. He says his being a political outsider should be a plus for voters. "You need people outside of government. If your primary goal is to continue your career, you tend to do things that are good for you, but not necessarily good for the country," he said. He's also been a vocal advocate for smaller government and is the chairman of Kentucky Taxpayers United. He says the government needs to stop borrowing money, because "we cannot borrow our way into prosperity." "For example, with the stimulus project, my little town -- they brought $1 million to. Republicans and Democrats clapped their hands and said, 'We have $1 million!' But no one asked the hard question: Where did that million dollars come from? "If we have to borrow it from China, Japan or foreign countries, is that good for our country to go further and further in debt to build a new ballpark or a new a parking garage? We have to understand where does the money come from. But debt leads to inflation," he said. Instead, he said, people need to look at the country's economic problems in the same way they view their personal budget. "I have a lot of older patients who have grandkids. They come in to me, and I say, 'Would you borrow money to buy a gift for your grandkids?' No, you pay for gifts out of your savings. But you don't borrow money to give people cash for clunkers. "I don't know how you get rich as a country by borrowing money and giving it to people and saying, 'Go to the mall and spend it,' and somehow we're supposed to be richer as a country," he said, echoing the sentiment his father shared during his 2008 presidential bid. Ron Paul said his son's political aspiration came as no surprise to him. "He's been interested in politics for a long time," he said on "American Morning." "I think the family sort of expected that he would be the first one to get to politics like this." His advice for his son: "Don't go with conventional wisdom." "If you go with conventional wisdom and the usual advisers, they're about 10 or 15 years behind the people. And I think that's what you're sensing with these town hall meetings," Rep. Paul said. "People, though, in a politician, they want to trust you. They want to like you, and they want to trust you. But it's up to the politician who's running to stand for something, and that's what energizes your base, your supporters, and raising your money." Ron Paul, who has served in Congress for 12 years, first sought the presidential nomination in 1988, running as a Libertarian. He ran as a Republican in the 2008 primaries, and while his campaign didn't pick up much mainstream steam, he did attract a large group of enthusiastic followers who had a reputation for voicing support for their candidate online. His presidential run was centered on a grass-roots effort that conducted Internet drives for funds. 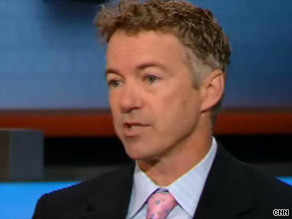 Name recognition probably won't help Rand Paul much, Cross said. Ron Paul doesn't have a high profile in the state because Kentucky's Republican presidential primary took place after Sen. John McCain had already become the party's presumptive nominee. But if Ron Paul, who has proved to be a successful fundraiser, tells his supporters that the election of his son would send a message to the GOP that it needs to get back to its core conservative principles, "that's a pretty strong message that I think would motivate a lot of contributors," Cross said.